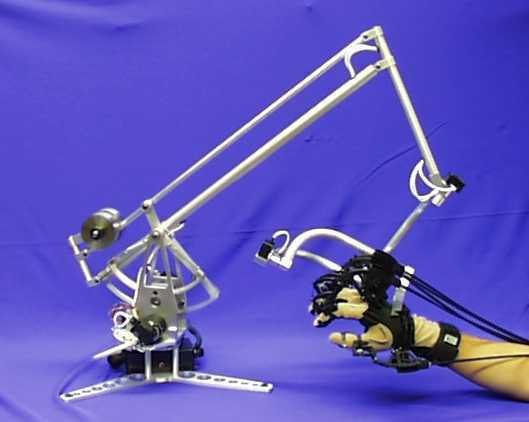 CyberForce™ is a force-feedback armature that not only conveys realistic grounded forces to the hand and arm but also serves as a six-degree-of-freedom positional tracker that accurately measures translation and rotation of the hand in three dimensions. 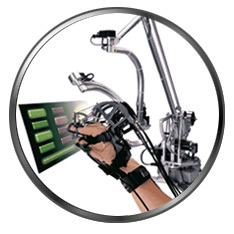 CyberForce is an option designed to work with VTi's CyberGrasp™, the award-winning, lightweight, force-reflecting exoskeleton that fits over a CyberGlove® and adds resistive force feedback to each finger. Using CyberForce together with CyberGrasp, an engineer can literally "hang his arm" on a virtual steering wheel, sense weight and inertia while picking up a "heavy" virtual object, or feel the impenetrable resistance of a simulated wall. The combination offers the most realistic whole-hand and arm-interaction capabilities on the market today for the desktop, and promises to dramatically advance the state of the art in real-time 3D interaction. To view our demo video featuring CyberForce, please choose 56K or ISDN download.